Things have been happening in RL, and yes that's with a capital T, so I've not really posted much lately. I'm hoping to change that. Though, I have given up hope of getting caught up with the 52 W.o.C. challenge. 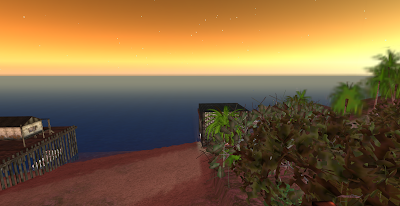 In SL news, I moved to a new place and it's AWESOME! Here's a pic from my balcony. Due to "Things Happening", I've decided to let World of Warcraft go for the time being and just concentrate on SL. If you go to my SL feed (see link on the right), you'll see some of what I've been up to lately. Btw, did y'all know that if you're a premium SL member, SL has a private sandbox area you can use? I just found it out and that's a load off my mind on how I would learn to build things with only a small plot of land.